Sweet Potato, a plant of the convolvulus family, variously classed by botanists as batatas edulis, convolvvlus batatas, and preferably ipo-maa batatas. It has a large edible root, creeping smooth stems, and very variable leaves; these are sometimes heart-shaped, often halberd-shaped or angled, and it is not rare to find them deeply lobed; the flower is much like that of the common morning-glory, not quite so much spreading, and of a rosy-purple color in the throat with white on the margin; it rarely produces flowers in the northern states. There is much doubt concerning the native country of the sweet potato, and there is strong evidence in favor of both its American and East Indian origin. It has not been found in the wild state in either country. Sweet potatoes were among the presents Columbus took to Isabella on his return from the new world, and the plant was in general cultivation in Spain in the middle of the 16th century; on the other hand, it is said to have been in cultivation in China and other parts of the East in very early times. It is believed that this is the potato of Shakespeare and other early English authors, and was known in Europe before the introduction of the white potato. The roots vary much in size and color, and there are several varieties in cultivation, the two most successful in northern localities being the Nanse-mond and Southern Queen, while in the southern states a variety known as the yam potato is regarded as one of the best. Not many years ago no one thought of cultivating the sweet potato north of Virginia, but it is now regarded as a profitable and important crop in Ohio, Illinois, and other western states, and in New Jersey in the east, and will succeed fairly in central Michigan. In the southernmost states pieces of the roots are sometimes planted, but even there the yield is better from sets or slips, a method absolutely necessary in northern localities. To procure the sets, the potatoes are laid upon the earth of a hot-bed, splitting the larger roots lengthwise and placing them with the cut side down, and covered with three or four inches of light, rich soil; sprouts soon start, and when these have made roots they are broken off to be planted, and the potatoes returned to the hot-bed to furnish more sprouts. The best method is to plant them in ridges, and this is essential to success in northern localities. The usual plan is to lay down a strip of well rotted manure and throw a furrow toward it by ploughing on each side, thus forming a ridge over the manure; other ridges are made in the same way, their tops about 3 ft. apart; after the ridges are well dressed into shape by means of the hoe and rake, the sprouts or sets are planted, upon them about 15 in. apart. The after culture consists in keeping the ridges clear of weeds until the vines cover them; the vines late in the season strike root at the joints, and it is necessary in northern localities to prevent this by moving them occasionally, in order to throw all the strength into the roots. In countries where there is no frost the plant is allowed to take root at the joints, as in this manner it perpetuates itself and does not need replanting. The vines are killed by a slight frost, after which the roots should be dug at once, dried, and stored. In the southern states they are kept in piles of 30 or 40 bushels in a well drained place, and covered with leaves or straw, and finally with earth. In colder regions more care must be given; small quantities are preserved in barrels or boxes packed in perfectly dry sand, and placed in a warm cellar; on a large scale they are stored in a house, where the temperature is kept at about 60° all winter. 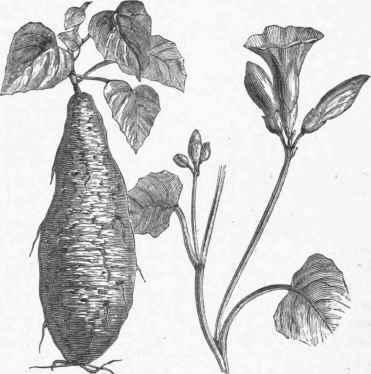 Several plants related to the sweet potato have in their roots a purgative resin, similar to that of jalap (which is also closely allied), but this in the sweet potato is replaced by sugar and starch, though there appears to be a trace of the principle, as many persons are unable to eat them on account of the purging they produce. In this country they are used as a vegetable to be eaten with meats, while in Mexico the proportion of sugar in the root is much larger, and they are there regarded rather as a sweetmeat. Persons at the north estimate the sweet potato, as they do the common one, by the amount of starch, as indicated by its mealiness, while in southern climates the amount of sugar is the chief consideration; those which contain much sugar are never light and starchy, but, being always moist and " soggy " when cooked, would be considered by most persons at the north as unfit for food. Not many years ago the northern markets were mainly supplied from the Oarolinas and Georgia, but they now come mostly from New Jersey, the soil of which is well adapted to the culture. - According to the census of 1870, the total production of sweet potatoes in the United States was 21,709,824 bushels, of which North Carolina produced 3,071,840, Georgia 2,621,522, Texas 2,188,041, Alabama 1,871,360, Mississippi 1,743,432, New Jersey 1,550,784, South Carolina 1,342,165, Tennessee 1,205,683, and Louisiana 1,023,706. Every state produced some, the fewest being 96 bushels in Vermont.